The one picture of this dessert that I have so doesn't give it justice. I took the picture before baking and the result of this endeavor was that wonderful feeling that comes sometimes from creating a food that looks like you have more skill than you really do. I felt like an artisan baker and even though I was baking off a recipe, it really felt like it was all me. This dessert was inspired by a dessert had at on a magical dinner that Eric & I shared at a lodge up north in Minnesota. It truly was a magical day all over. The trip was a surprise to begin with, we drove to this heavily wooded area and smack dab in the middle of a 7" snow storm. IT WAS AWESOME!!! I know many will be not happy that I am posting snow pictures in the middle of July, but this day was so special to me that it will so be worth it. There was the snow storm that gave the impression that we were stranded; there was a wine tasting in the lower area of the lodge where we were when the power went out; there was the walking through the big chunks of snow and it was all finished off with an amazing dinner. I love that weekend! 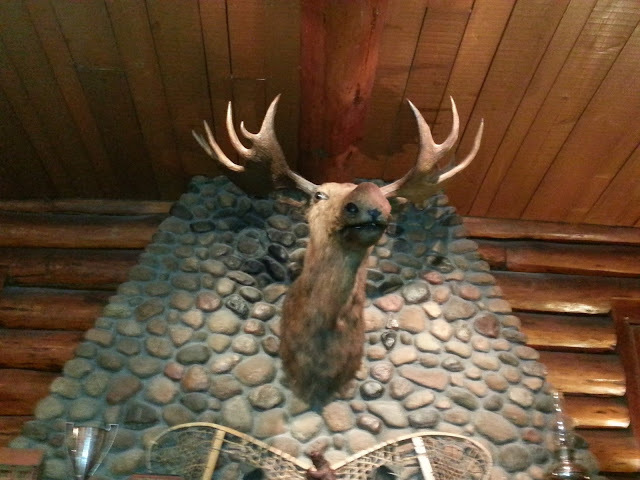 Oh, did I mention, it included a moose, too?! That thing just made me laugh! The dinner included a simple apple tart for dinner with home made vanilla ice cream. That was the inspiration for this dessert. I had pears at the house instead of apples and that was the deciding factor on whether I was going with an apple or pear tart. Please forgive the snowy pictures. If it makes you feel better, I am typing this while on my patio in 75 degree weather. 1 pear, peeled, cored and thinly sliced. Mix 1 tsp flour, 1 Tbls sugar, cinnamon, nutmeg and salt. Toss pear slice and let sit while preparing the dough. For the dough, combine 1/3 cup flour, whole wheat flour, 1 Tbls sugar in a bowl. Cut in butter with pastry cutting or fork. When the dough is crumbly, work in the oil with fork until it holds together. Add 1 Tbls water until dough stays together with fork. Add up to 1 Tbls more if the dough feels dry. Line your counter with parchment paper and sprinkle with flour. Round your dough into a patty shape, sprinkle with flour and roll out to about a 10 inch circle. Transfer the whole parchment to a baking sheet. 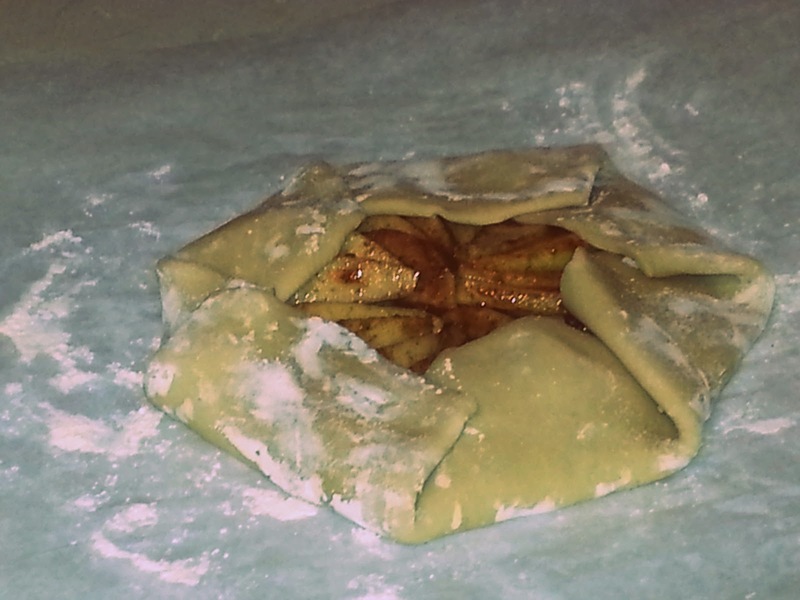 Arrange pears in a round, slightly overlapping pattern working around the center of the dough. Leave at least 1 inch of border around the edges and pour in the remaining bit of pear juice over the fruit. Fold over the sides of the dough, a little at a time, working around the pears. Note- the dough will not meet in the middle. Place in the oven and bake for approx 40 minutes, until the pears are cooked through and nice and bubbly. Let sit for 10 minutes before serving. Serve plain, sprinkled with powdered sugar, with vanilla ice cream or fresh almond whipped cream. No matter how you serve it...ENJOY!! !